To be perfectly honest with you, the Diplomat Dress is my favorite dress. Ever. I was inspired to design this dress when I found myself collecting all sorts of images of dresses with a similar silhouette. All those images, both vintage and contemporary, went up on my inspiration boards so I could spend some time studying them to determine what it was about them that I liked. There were several features that were especially compelling. First of all, I think the silhouette is flattering to a variety of figures because its gentle, flattering lines skim the body but still gives you a nice shape. In other words, it’s a feminine, figure-flattering dress. The bodice is fitted and slim through the waist, while the A-line skirt can camouflage hips or give the illusion of curves, depending on your figure type. This dress actually emphasizes and enhances an hourglass shape. My favorite part of this style is the yoke seam. We constructed the pattern so that the lines are very clean and simple, and to do that we moved all of the shaping, including the bust darts, into the seams. This gives the dress a contemporary look, and it also gives you a great opportunity to play with the topstitching along the seams. I emphasized the seams on my navy linen version, above, by topstitching them in a turquoise thread to match my favorite shoes and turquoise necklace. 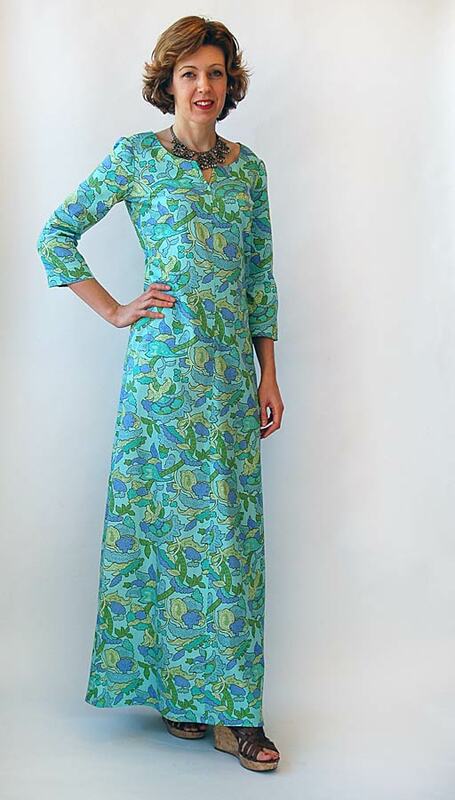 When I made the maxi-dress version, below, I downplayed the topstitching by stitching it in a matching thread so it didn’t detract from the dramatic print. I also like the neckline on this dress. It’s a nice, open shape with a little notch detail that deepens it a bit while still remaining demure and sweet. The pattern comes with three different views, so you can mix and match them to sew your own style. Choose from sleeveless, short sleeves, or three-quarter sleeves. And select the length you prefer: from a mini-dress, just above the knee, or the more dramatic maxi-dress length. For my Palm Springs version (the maxi-dress, above) I added the three-quarter sleeves to the maxi dress length because I wanted a caftan look. I hope you’ll like this dress as much as I do. I’d love to see how you wear it! 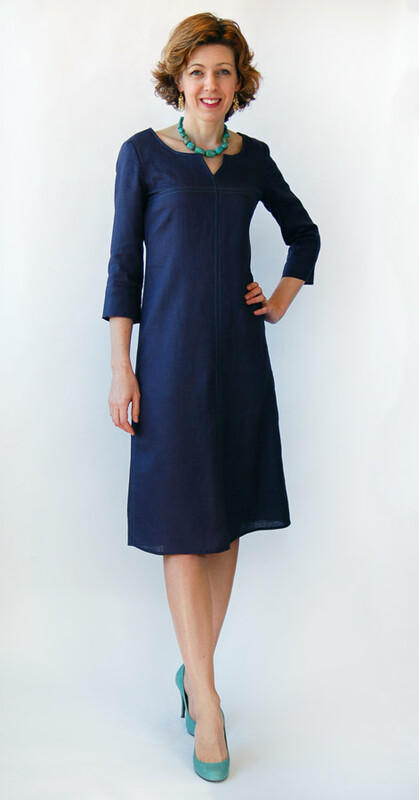 I really love the dress, especially the navy linen version. I may have to make something similar!! It’s just perfect for spring. I’m just so excited for these. Thanks to y’all for all your hard work!! I’m so impressed! P.S. WANT those turquoise shoes!!! Love this dress, especially your blue linen & Nightknitter’s in the Lotta Jansdotter print. Such a simple & flattering fit! In the other Lisette patterns I’ve used, I’ve had to size down a bit from what my measurements recommend because of the large amount of ease Simplicity builds in. (I’ve used the high bust measurement you mentioned with a chart in an earlier blog post, and find it works better.) This dress has much less ease, according to the finished measurements, so that I would only have about 1 to 1 1/2 inches ease at bust. Do you think the same downsizing holds for this dress? Hello Liesl, this dress is so beautiful! I especially like the navy version, so simple and beautiful, and the way you styled it is just lovely! I love turquoise and I am now on the hunt for some shoes like yours ! Lark, it all depends on how you like to wear your clothing. I would suggest comparing the measurements on a few things you own and like to see if you’ll be comfortable with the fit. I always size down by one because I don’t like a lot of ease, but it’s really a matter of preference. I hope you’ll show us your finished dress! And thanks, everyone, for your enthusiasm for the patterns. We’ve got one left to introduce yet! The navy version is sublime. I really like the elegant navy version. It’s nice but can still pass for casual, I think. I am very interested in the construction. I’ve never tried seams across the bust like that. The overall shape of the dress is lovely and it seems like I could really learn something from this new construction technique. I love the shape of the long sleeves and all the sleeve options. Do you think I Coukd add pockets without ruining the lines of the dress? I always seem to need pockets in the spring and summer. Can this pattern be modified for maternity?